May 12, 2012: Brothers and Sisters in Single Payer Bowling IV! It’s that time of year again, folks, when we get together and bond-by-bowling with Donna and Larry Smith and all our favorite single payer peeps! 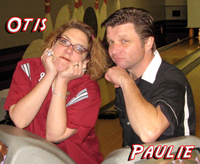 Paulie and Otis are back to welcome everyone to “Single Payer Bowling IV”, Saturday, May 12, from 2-5 p.m.! This is a fundraiser and “split-tastic” coming together if you will, to support the great work of the ISPC, and a great time to meet, greet and mingle with all your single payer cohorts! Other organizations endorsing single payer bowling and working hard everyday to keep corporate healthcare from going OVER THE LINE include: PDA IL, PNHP, Chicago Single Payer Action Network and yours truly, Illinois Media Progressives. $25. gets you 2 big hours of bowling, a pizza and a pitcher of beer or pop for your lane, and the company of the bestest health care activists this side of the Pecos. Tell ’em Paulie and Otis sent ya! This entry was posted on Friday, April 20th, 2012 at 1:27 pm and is filed under Uncategorized. You can follow any responses to this entry through the RSS 2.0 feed. You can leave a response, or trackback from your own site.